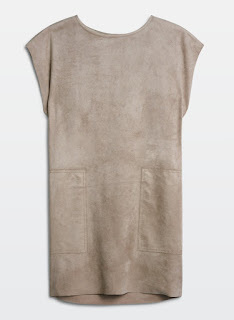 This week's coveted item is the Nori dress by Wilfred Free. I love the beautiful faux suede fabric and billowy cut. It's available in a rainbow of colors and the cut is flattering to many body types. As a petite and curvy lady I used to be afraid to try silhouettes that weren't cut close to the body. Lately, I've been branching out and dressing based on what brings me joy and makes me feel pretty. I love draped silhouettes and feel silly for avoiding them because of the messages out there about how I should dress my body type. Pairing the dress with a vibrant scarf and accessories, like a bold cuff, would make for a fun look. I can see over-the-knee boots, booties, pointed-toe heels, and white sneakers all complimenting it and changing your look to suit many occasions.